Yang Lu Chan is undoubtedly the most well known Chinese martial artist in the world. The story of his obtaining the secret art of taijiquan in the remote village of Chen Jia Gou and his fame as "Yang the Unbeatable" (Yang Wudi) are common stories amongst taiji players the world over. Yang Lu Chan's reknown comes as little surprise when we consider that the art he created - Yang Style Taiji Quan - is the most popular form in the world today and is practiced all around the globe. What is more surprising is that he made a little known Chinese family art into a common exercise practice in America in less than one hundred years. The familiar story of Yang Lu Chan being challenged by the Emperor's Head Guard presented him with the opportunity for lasting fame overnight. It also offered ruin as quickly if he lost. Yet to prevail would not mean peace, for the Imperial Guard would have lost face and could never have let the Yang family rest. The Master reasoned the only way out, preserving his reputation as "Unbeatable" yet avoiding retribution, was to fight to a stalemate. To do this Yang felt a fighter's skill must be three time greater than his opponents. History records that the bout did indeed end with a draw. That major obstacle over come, another fell in Yang Lu Chan's path. The Imperial family decided Yang would teach them his art. Today it is difficult to see how this created a problem for the Master. But China's rulers at the time were Manchu's from the North. The Chinese thought of them as invaders and outsiders. Patriotism in mind, Yang did not want to give his art to outsiders. Yet an Emperor's wish is dangerous to deny. So Yang Lu Chan created a New Yang Style, similar in posture to the Chen family's style, but leaving out many parts of his personal style. This was the beginning of what we now know as the Yang Jia (Yang Family) Mi Chuan (Hidden Tradition) or Lao (Old) and Xin (New) Yang styles. One style kept within the family and the other open to the public. Later when Yang Lu Chan's sons , Chien-ho and Ban-ho, and Grandson, Chen-fu began to teach all Chinese they secretly continued this two form tradition out of necessity. For if the aristocracy learned of Yang Lu Chan's earlier deception, trouble would soon arrive. Many martial artists (particularly non-Yang stylist) claim that the New Yang Style is useless martially, and that Yang Lu Chan purposely made it so. This claim is completely without basis as even a quick review of Chinese martial history and contemporary masters shows. Yang Lu Chan's grandson, Yang Chen-fu never studied the older Mi Chuan form, yet was well known as a boxer. Many of Chen-fu's students, notably Chen Wei-ming and Cheng Man-Ch'ing, are taiji legends today. And America's most well known exponent of taijiquan's martial component, William CC Chen, studied the New Yang Style form exclusively. Yet what then remains of the Yang tradition and what does the Mi Chuan form hold that the New form lacks? Amazingly the Mi Chuan part of the Yang style was within one teacher of extinction. The story of its preservation is typical of the twists and turns of Chinese martial history. Yang Lu Chan had long been dead when his son Chien-ho decided to pass the secret art outside the family for the first time. In that era reputations were made through challenges not workshops. Yang Chien-ho once had a bout with a master from the Zi Ran Men (Natural Style School), Du Xing-wu, which had been a draw and remained unsettled. A student of Du's decided to re-challenge the Yang family for his teacher. This student's name, Wan Xing-wu, was fast becoming known in China as he traveled making and winning challenges. When Wan arrived at the Yang family training center, the students inside were all concerned that they would be called upon to go out and face this challenger. As they stood in the court yard looking at each other one spoke up, Zhang Qin-lin. "Okay, I'll go see what Wan wants," said Zhang and he went out the gate. To everyone's amazement he returned in a few minutes unhurt and Wan was gone. Zhang told them Wan had "asked for a lesson so he could learn of the Yang style" (the polite way of issuing a challenge). To which Zhang agreed. Knowing that the Zi Ran Men fighters were particularly good with their feet, Zhang was on his guard when Du began with a right kick. Zhang swept it to the side and threw his punch into the opening. Wan at the same time also threw a strike and their hands collided. Wan immediately stopped and bowing shouted "Gao Ming (great)!" Zhang assumed Du's wrist had been so hurt that he could not continue. Zhang at that time had been studying the New Yang Style with Yang Chen-fu. Chien-ho, having seen Zhang's loyalty and love of his teacher called him into his personal quarters to look him over. Chien-ho noticed that Zhang truly had the body of a martial artist. He was short and heavy with hands and feet that were twice as big as normal. He had ventured to the Yang family's home at the age of fourteen after his parents death to pursue his love of martial art. Chien-ho seeing this decided to secretly teach Zhang the Mi Chuan form never before seen outside the Yang family. Zhang Qin-lin was later to become famous by winning the All China Fighting Championships in 1929 in the unarmed division. T.T. Liang (Cheng Man-ch'ing's senior student) described Zhang as having amazing abilities. 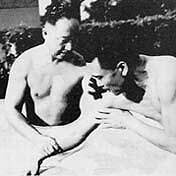 During the Second World War, Cheng ran into Zhang in Nanjing. They had both studied under Yang Chen-fu and the younger Cheng must have wanted to test himself and challenged Zhang to push hands. Liang described the encounter with a wave of his hand, "Zhang just pushed him down." 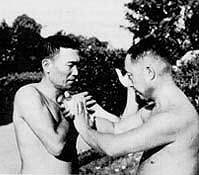 The story goes that Cheng bowed to Zhang and studied push hands with him for nine months. In the end, Cheng challenged Zhang to a fight and was knocked out. What made Zhang so strong? Liang said "He learned something in the mountains from a Taoist." It was Zhang's Taoist lifestyle which lead him to choose a quiet life instead of one teaching martial arts. In all Zhang only taught seven students (Cheng Man-ch'ing, Wang Shan-zhi and Li Yun-long of Hebei, Hu Yao-zhen, Liu Zhi-liang, Su Qi-geng and Wang Yen-nien of Shanxi) . Of these seven only one remains alive; Wang Yen-nien living in Taiwan teaches the Mi Chuan Taijiquan. Wang was able to study with Zhang only after he received an introduction from his father who was studying Taoist Mediation at the same Dao Guan (Taoist study center) as Zhang. Today at 86 Wang is the last and youngest of Zhang's students. No one knows what ultimately became of Zhang Qin lin. Du Xing-wu later became Sun Yet-sen's personal body guard. Scott Rodell is the Founder and Director of the Great River Taoist Center (headquartered in Washington, D.C.), and has branches in Baltimore and across Russia, Estonia and Finland. He began studying martial arts at nine years of age. Experience included Karate, Judo, Tournament & Instinct Archery, Wrestling, Olympic Fencing & Marksmanship before devoting his training full time to taijiquan. In taijiquan he has over 20 years training in two branches of Yang Taijiquan. He studied with several senior students of Zheng Manqing, including noted masters William C.C. Chen & T.T. Liang. He also studied push hands & free fighting with Chen & push hands & sword with Liang. Rodell is also a disciple student of Master Wang Yen-nian of Shanxi province with whom he studied all aspect of Yang family Michuan (Secret Teaching) Taijiquan. During the late '80s was Push Hands Champion at several Nationally Sanctioned tournaments & placed Second in Push Hands at the International Championship held in the Republic of China in 1991. Rodell has been teaching regular seminars from beginners taijiquan to advanced Chinese Swordsmanship in Europe since '91. He was awarded “Honored Judge” rank by the Russia Wushu Federation (their highest rank), and is author of "Taiji Notebook for Martial Artists and "Chinese Swordsmanship, The Yang Family Taiji Jian Tradition". Rodell was also one of the first ten Americans to enter the door of the Jin Shan Pai, a traditional school of Daoist Neigong (qigong). Rodell, initiated into the Jin Shan Pai by Wang Yen-nian, is a sixth generation teacher in this tradition. Through the Center, local students in the Jin Shan Pai are working to create a Retreat Center for the development of Taoist practice. He is also proprietor of Seven Stars Trading Co. specializing in Imperial Chinese Arms & Armor.